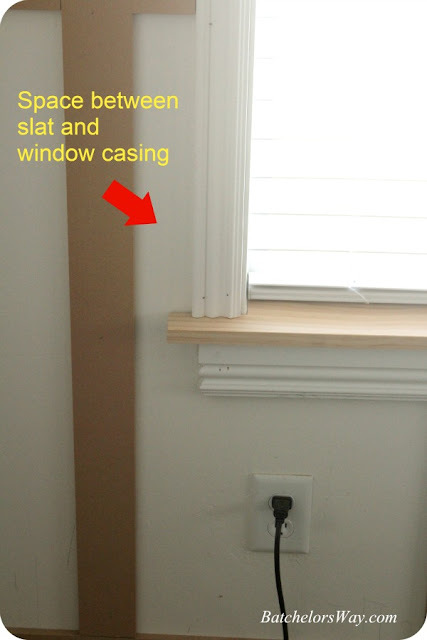 After you read today's post head on over to Sawdust Girl and read my tutorial on how I do Board and Batten outlets. 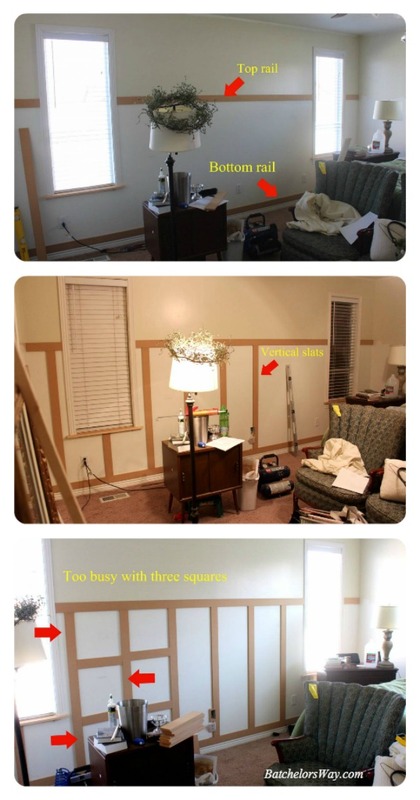 OK, I think I pinned about a million pictures of board and batten wall treatments. Everything from round, lattice, and square variations. If you follow me on Pinterest you know. I knew I wanted some version of board and batten on my bedroom walls and I finally narrowed it down to one and was ready to start. A few years ago when doing the wall treatment in Austin's Room we discovered these 16 foot long by 3 inch wide by 1/2 inch thick MDF boards in the roofing area of Lowe's. They cost just over $4. Score!! So naturally I went to find them when I was ready to work on my bedroom. But they were not there! Just a big empty space. I tried calling other Lowe's stores to find them, but no one really seemed to know what I was talking about. Some guy finally said Lowe's would no longer be carrying them. And they were on clearance for $2.34!!! So I bought 30 of them!!! Yes that was more than I needed!! So what are these boards called? When I went to write this post I couldn't remember for sure and went back to Lowe's to verify. There they were but there was no tag! I thought they were called Raw Hook or something. No one at Lowe's called them the same thing. One guy called it Shelf Cleat and another called it Clip Strip or Chip Clip (What?). We finally found it in their computer under Raw Hook Strip. We also found they would no longer be carrying this product in their stores, and our Lowe's was the only one in the Salt Lake Valley with any left in stock! Oh and they were marked down to 29 cents each!!!!!!!!!! Soooo, my crazy husband and I bought all that they had, 94 boards to be exact. We had to build some shelf supports just to have a place to store them. I'm sure other Lowe's stores somewhere have them so go find them before they are gone!! I would think you might find these at other home improvement stores, tell me if you find them and I'll pass the word along. If you live in the Salt Lake valley, sorry. I started by running the top and bottom slats first. Nice thing about these 16 footers is no joints to worry about. One piece can cover one wall. Next, I attached all the vertical slats. Then I cut a bunch of the small cross pieces and set them in place. Originally, I wanted three squares down, but it just didn't look right in this room. So I went with one square at the top. My biggest challenge was getting the spacing just right. I knew how big I wanted the squares, but I wanted to land on the least amount of outlets and switches. More importantly I wanted to make sure I had space on either side of my window casing. I thought it would look funny to have a vertical board right next to the window casing. I had two windows on my first wall. I am not a super math person! I am a visual person! So I made a story board. I used a scrap piece of wood cut to equal the width of my square and one slat. Then I drew a line to show where the slat would be. 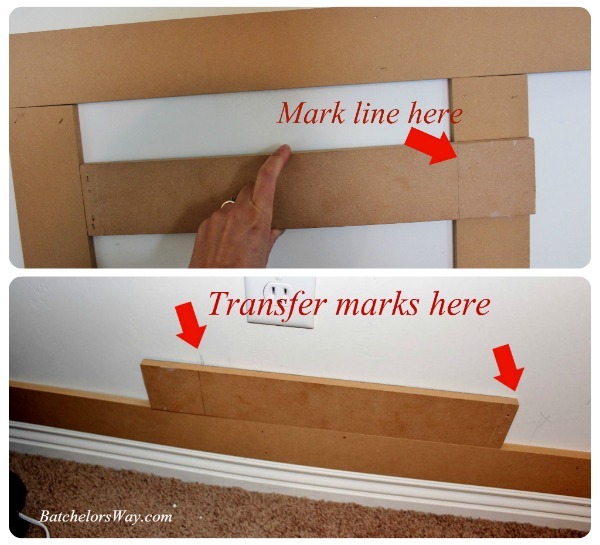 Next, slid the story board along my wall marking where the slats would fall. I did this multiple times until I was happy with where all my vertical slats would fall. Then I just started attaching my slats on my final marks. Alright that's enough for today! Be back soon to show you more of this huge project!!! Wow, big score on all those boards! I'm going to check my local Lowes and see if they still have some. Congratulations on being a contributor writer over at Sawdust Girl, you go Girl! Heading over to check the post.